In addition to operator ease, we were determined to overcome the greatest challenge for this industry; hills and slopes without the rototilling effect. After 20,000 hours of testing and development, we’re proud to introduce the TR360 designed to turn frustration into revenue. 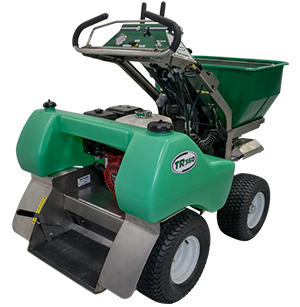 Innovative patent-pending designs combined with our in-house manufacturing are the key to the quality you’ll find in the TR360 spreader. The TR360 features all stainless steel construction, laser cut, machined and assembled in the USA. will revolutionize the fertilizing industry. We’ve taken every feature of the available commercial ride-on spreaders and reengineered their short-comings. Continuous innovation, reengineering and over 20,000 hours of usage and testing to achieve a ride-on spreader that meets the approval of operators. The TR360 is designed for reliability, durability and unparalleld performance, not to spend hours in the the repair shop. Everything for preventive maintenance is easily accessible. Start today taking on clients with hills and slopes and keeping your employees happy. Shop now for your TR360 ride-on spreader.